Grant Morgan runs NZ's leading Trotskyist group, Socialist Worker, the local body electoral coalition, Resident's Action Movement and the recently founded Solidarity Union. His partner Robyn Hughes is a RAM, Auckland Regional Councillor. Morgan co-edits Socialist Worker's Unity magazine, he is involved in solidarity work for Hugo Chavez's Venezuelan revolution and is a leader of the Workers Charter movement, a coalition of Marxist groups and certain militant unions and "community groups". He also has close ties to the Australian Marxist-Leninists of the Socialist Alliance and the Democratic Socialist Perspective. He is easily one of the most influential Marxist-Leninist revolutionaries in his part of Mangere Bridge. Not bad for a former railwayman from Hamilton. 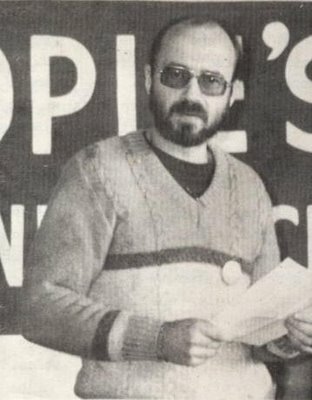 Grant Morgan joined the Communist Party of NZ in 1976. He served his "political apprenticeship" under Hamilton based Stalinist, Communist Party leader and former Huntly miner, Harold Crook. In 1981, Morgan was one of the revolutionary heroes who invaded the pitch and stopped the first Springbok/All Blacks test at Hamilton's rugby park. Soon a leader of then Stalinist Communist Party, Morgan led its nearly 100 followers in campaigns against the Socialist Unity Party's "Trade Union Compact" scam of the late '80s and against National's Employment Contracts Act in the early '90s. Morgan also helped lead the State Housing Action Committee's of the early '90s which mounted a campaign of partial rent strikes, culminating in the abolition of market rentals for state houses. Probably Morgan's greatest achievement was in steering the evolution of the tiny, proudly Stalinist Communist Party, into the tiny, proudly Trotskyist, Socialist Workers Organisation. This was the political equivalent of turning the most austere, self mortifying, conservative Catholic sect imaginable into a bunch of gospel singing, Lord praising, happy clapping, holy rollers. When he's not occupying the Auckland Uni registry, protesting against APEC, joining Matt McCarten's UNITE union, running RAM, the Workers Charter Movement, Solidarity and Climaction, Morgan apparently makes "very fine fruit wines". Just proves that no-one is totally useless.